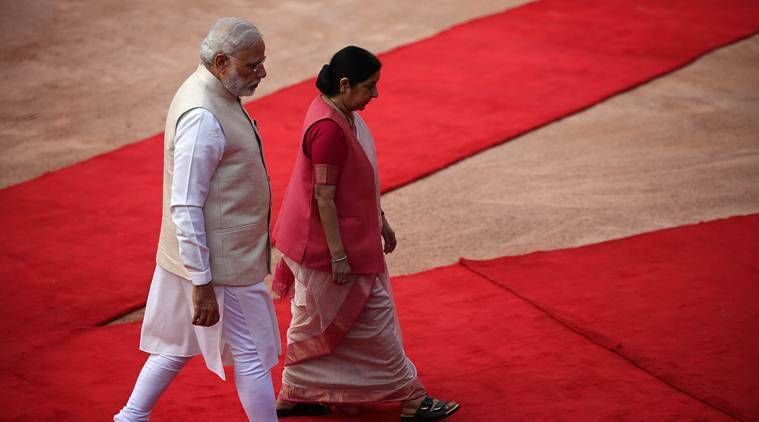 One of the interesting foreign policy ideas that Prime Minister Narendra Modi unveiled early in his tenure, was to enhance the role of states in India’s engagement with the world. His long stint as Gujarat Chief Minister and his interest in the diaspora had probably something to do with it. Five years later, there has been some progress on the margins. The NDA government created a “states division” in the Ministry of External Affairs to facilitate the international interactions of the state governments on a range of issues — from promoting trade and tourism to attracting foreign investments. It has also hosted visiting dignitaries in state capitals. But the problem of finding common ground with state chief ministers on developing effective neighbourhood policies has not disappeared. The decade-long UPA rule had seen some states wresting unprecedented control over foreign policy towards the neighbours. In West Bengal, Mamata Banerjee wrecked, in her spectacular way, a carefully prepared visit by Prime Minister Manmohan Singh to Bangladesh in 2011. Although the state government officials had participated in the negotiation of an agreement on sharing the Teesta river’s waters, Banerjee vetoed the agreement hours before the PM’s meeting with Sheikh Hasina. It was probably one of the worst moments for Indian diplomacy. It brought into stark relief Delhi’s inability to deliver on initiated agreements and exposed the profound domestic weakness of the UPA government. If Mamata played the spoiler on Teesta, the UPA government could not muster the necessary support in Parliament for the ratification of the other main achievement of PM Singh’s visit — the land boundary agreement with Bangladesh. It was a miracle that ties with Bangladesh survived these twin setbacks. If the Indian leadership looked diminished in Dhaka, Sheikh Hasina, who kept faith with the agenda of improving ties with Delhi, emerged as the Subcontinent’s tallest leader. That Delhi was being run by a coalition government was one part of the problem. That assertive leaders like Banerjee were willing to play fast and loose with national interest was the other. The UPA government had neither the power to persuade the state leaders nor the political will to challenge the state leadership. It was far too afraid of losing future electoral support. Delhi’s decision to not attend an international conference in next door Colombo, in order to appease whipped up sentiment in Tamil Nadu, once again exposed PM Singh’s weak hand in the conduct of foreign policy. He was apparently eager to attend the meet and understood the diplomatic costs of not doing so. Media reports suggested that the Congress leadership had overruled him. Modi won an absolute majority in the Lok Sabha in 2014 and has had a stronger say in shaping the ruling party’s policies. This had an immediate positive effect on foreign policy, for example, in relations with Bangladesh and Sri Lanka. Modi overruled internal opposition in the BJP to the ratification of the land boundary agreement with Dhaka and ensured its early passage in Parliament. As part of his early tours in the neighbourhood, Modi travelled to Sri Lanka and launched intensive dialogue with both the Sinhalese and Tamil communities. A majority in the Lok Sabha helped Modi to prevent the Sri Lanka policy becoming a hostage to Chennai politics. Will that remain true if Delhi returns to the era of coalition governments in 2019? Can the next government pursue productive engagement with Colombo if its survival depends on support from the Dravidian parties? Can a weak coalition in Delhi balance the explosive political dynamic in Assam on the citizenship issue with the need to strengthen the partnership with Dhaka? Can the next government consult the chief ministers of Bihar, Uttar Pradesh and Uttarakhand to improve strained ties with Nepal? In 1996, the then West Bengal CM, Jyoti Basu, lent strong political support to the H D Deve Gowda government to wrap up the agreement on sharing the Ganga waters. Banerjee, locked in a perennial scrap with the Centre, has refused to facilitate the implementation of the Teesta waters agreement negotiated during the tenure of Manmohan Singh, and backed by PM Modi. Over the last decade, the sustained improvement of ties with Bangladesh has been the single most important regional advance for India. If Delhi had Kolkata’s support in engaging Dhaka, the transformation of the eastern Subcontinent could have been sweeping. Affiliation to rival parties has not always been a barrier for collaboration between the states and the Centre. During his earlier tenure as the Congress Chief Minister of Punjab, Captain Amarinder Singh, worked with the Atal Bihari Vajpayee government at the Centre in launching sub-national diplomacy with the chief minister of Pakistan’s Punjab province, Chaudhry Pervez Elahi. Today again, he has taken a responsible approach on the issue of Sikh pilgrimage to Pakistan. Prospects for a sensible neighbourhood policy can’t rest solely on having single-party governments at the Centre and “responsible” CMs in the border states. India needs a measure of political consensus on regional policies. If the political classes choose to turn every problem in the neighbourhood into a domestic contestation, Delhi’s adversaries will continue to gain ground in India’s neighbourhood. The current intense politicisation of ties with Pakistan might seem like an exception. But similar dangers lurk on all of India’s frontiers. This article first appeared in the print edition on March 26, 2019, under the title ‘Why foreign policy needs consensus’. The writer is director, Institute of South Asian Studies, National University of Singapore and contributing editor on international affairs for The Indian Express.